Poas Volcano is just over a 2 hour drive from San Jose or Alajuela. The park has an amazing view of the second-widest crater in the world. This volcano has three craters, only one of them active. The active volcano has a crater 9/10 of a mile wide and 984 feet deep. It contains the largest active, boiling lagoon in the world, at 1,148 feet wide. North of the active crater is the long-extinct Von Frantzius composite cone, the oldest crater in the central volcanic mountain range system. Water from the lake drifts down the mountainside becoming the Sarapiqui River that then flows eastward to the Caribbean coast. The best time to visit the volcano is from May to November — the earlier in the day the better. 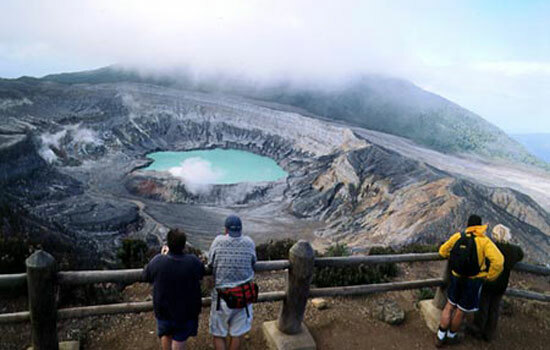 Your walk will take you to the active crater for a look at the plumes of sulfuric smoke and water vapor and along natural trails leading to the Botos Lagoon. It is one of the few accessible active volcanoes in the Americas.